The Copeland Scroll+û Outdoor Condensing Unit was designed based on three factors demanded by industry users:Energy EfficiencyUtilizing scroll compressor technology, variable speed fan motors, large capacity condenser coils and advanced control algorithms to optimize fan speed, energy consumption is significantly reduced. Compared to hermetic reciprocatingunits, end-users will save more than $350 in annual energy costs.Reliability Combining the proven reliability of Copeland Scroll compressors with advanced CoreSense+û Diagnostics, equipment reliability is greatly enhanced. Fault code alerts and fault code retrieval capabilities provide information to help improve speed and accuracy of system diagnostics. Integrated electronics provide protection against over-current, over-heating, incorrect phase rotation, compressor cycling, high pressure resets, low pressure cut-outs and liquidflood-back conditions that cause unexpected performance losses or worse, unplanned equipment failure.FlexibilityThe slim shape and light weight make the Copeland Scroll Outdoor Condensing Unit aesthetically appealing and eases the installation process. The ultra quiet variable-speed fan motor significantly reduces exterior sound levels, allowing additional location flexibility. Combined with optional wall mounting capability, they deliver unmatched flexibility. 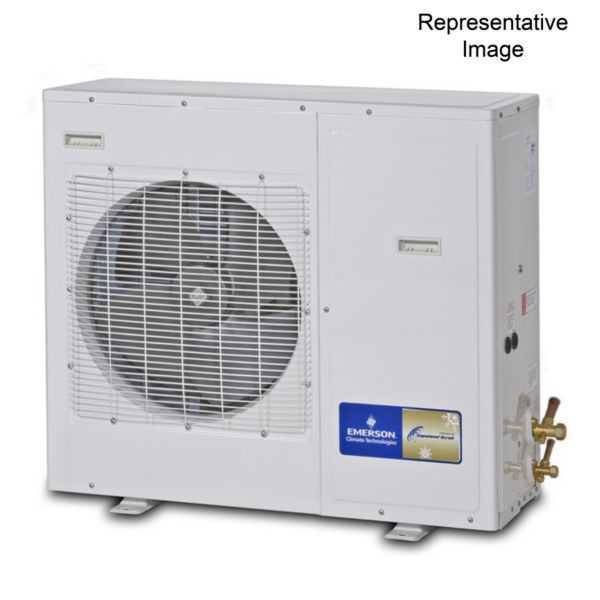 Copeland Scroll Outdoor Condensing Units are perfectly suited for walk-in cooler and freezer applications. All units integrate the many benefits of scroll compressor technology, fan speed control and CoreSense Diagnostics. The integration of these technologies deliver higher energy efficiency and lower sound levels, while ensuring reliable performance and operation in foodservice applications. Plus, all units feature variable-speed PSC fan motors that meet or exceed all national standards.Standard Features Pre-painted enclosures for corrosion protection. Electronic defrost control with programmable defrost scheduling. Brass service valves located externally for easy access. Electronic low pressure control for quick set-up and higher accuracy. Receivers with pressure relief valve, liquid shut-off valve and charging port. Easy to read moisture indicator. Variable-speed PSC fan motors. Advanced CoreSense Diagnostics. Over-sized condenser coils with additional fin corrosion protection for coastal zones. Light weight, slim-line profile for maneuverability and ease of installation. All units are factory tested for braze joint leaks, wiring connections, electrical continuity and start-up performance. Oil seperator and accumulator standard on low temperature models. Heated insulated receiver for low-ambient operation.